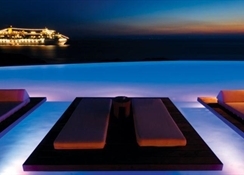 The Cavo Tagoo Mykonos is a luxury 5-star hotel located in Tagoo, Mýkonos City in Greece. The well-established hotel offers magnificent views of the pristine blue sea. Apart from the swimming pool, the hotel houses the popular aquarium bar. The hotel also boasts a high-end spa and wellness centre that offers a variety of messages and wellness treatments to the guests by professional masseurs. The luxury hotel complex, that has villas, rooms and suites as accommodation options, is an ideal option for vacationers who desire for a sunny beach holiday in Greece. The town of Mykonos also allows the guests to experience the heritage, culture and modern-day lifestyle of Greece up-close. The hotel can also serve as an ideal venue for destination weddings. The Cavo Tagoo Mykonos is located 4.9km away from the Mykonos International Airport and 40.9km from the Syros Island National Airport. The town of Mykonos is located 2.7km from the property. The nearest beach is 50m away from the hotel. Local tourist attractions like Mykonos Old Port, Archaeological Museum of Mykonos, Glam Club, Panagia Paraportiani Church, Little Venice, Mykonos New Port, Meletopoulou Public Garden, Mykonos Windmills, Armenistis Lighthouse and the Nammos Mykonos are located at a range of 5km away from the hotel. On special requests, the hotel management can arrange for rental cars for local excursions and airport transfer. The Cavo Tagoo Mykonos has tastefully designed rooms with elements of classic Greek architecture and prominent shades of white, blue and other bright colours. The rooms are majorly categorised into three types: Rooms, Suites and Villas. All the rooms are divided based on space, amenities and number of guests. Suite with Private Pool, One-Bedroom Villa with Private Pool, Two-Bedroom Villa with Private Pool, Honeymoon Suite with Private Pool, Premium Room Sea View, Junior Suite with Outdoor Hot Tub, Suite with Indoor Hot Tub (2-3 Adults), Suite with Outdoor Hot Tub, Two-Bedroom Suite with Outdoor Hot Tub, Junior Suite with Pool, Premium Room, Premium room with Pool, Two Bedroom Suite with Pool, Classic Room Side Sea View, Classic Double Room with Pool and Side Sea View and Cave Pool Suite are the types of room on offer. The room includes all modern day amenities like air-conditioning, free Wi-Fi, flat screen satellite TV, etc. The bathroom is also equipped with amenities like shower, hot-tub, bath linens, and essential toiletries. The Cavo Tagoo Mykonos houses an all-day lounge, bar and restaurant that serve a wide range of local Greek and international cuisines along with local wines and signature cocktails. The proximity of the hotel to the town of Mykonos allows the guests to try the local restaurants and bars that are known to serve a wide range of local Greek and International cuisines along with local wines and an assorted range of cocktails. 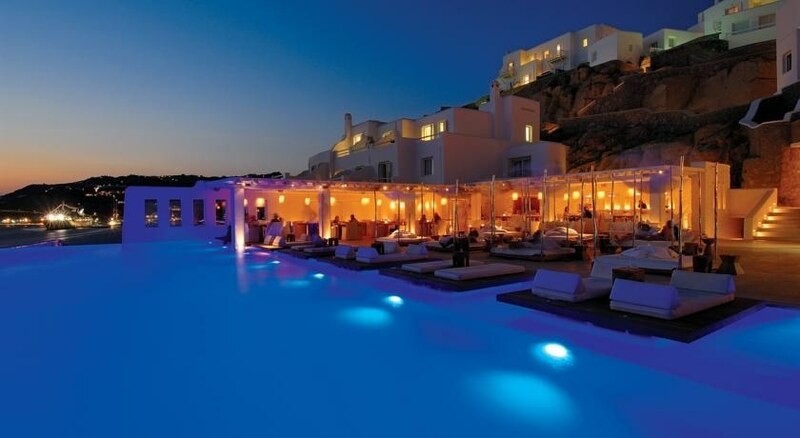 The Cavo Tagoo Mykonos houses swimming pools where the guests can play pool games and enjoy refreshing dips. 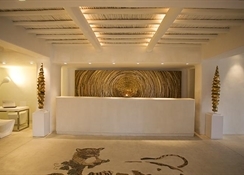 The hotel also houses a high-end spa and wellness centre that offer plenty of massage options by professional masseurs. The guests can avail the services and pamper themselves. The proximity of the hotel to the sea allows guests to try water sports that are offered at the beach. Apart from that, the guests can visit the town of Mykonos for sightseeing and visit attractions like Mykonos Old Port, Archaeological Museum of Mykonos, Glam Club, Panagia Paraportiani Church, Little Venice, Mykonos New Port, Meletopoulou Public Garden, Mykonos Windmills, Armenistis Lighthouse and the Nammos Mykonos.